Do you have our copy of Memento on DVD? 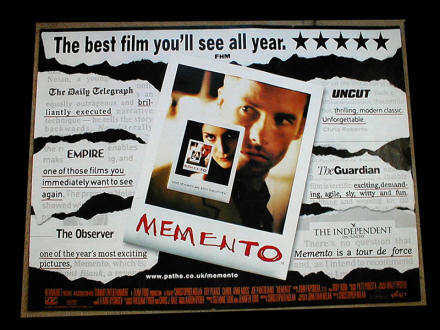 Back in the olden days, back when we were living in Edinburgh, we had a fine collection of films on DVD, including arguably the finest movie of 2000, Memento. Then we loaned it to someone. But we now can’t remember who. Presumably because we didn’t take the precaution of immediately writing that information on our bodies and at a more convenient time having it tattooed as a permanent reminder. So, if you do have our copy of Memento (or indeed Team America: World Police) could we please have it back please? Posted on Tuesday 9 January 2007 Thursday 14 December 2017 Categories General4 Comments on Do you have our copy of Memento on DVD?